Includes TowCommand integrated trailer brake controller and manual telescoping trailer tow mirrors. Includes 5-speed electronically controlled automatic transmission with Tow Haul feature. Includes heavy service front springs, steering damper and rear stabilizer bar. Includes transfer case and fuel tanks skid plates. Includes highest front GAWR springs (6000) and steering damper. Includes power locks, power front side windows, one touch down on driver's side and fold away power black mirrors. Includes 6.8L V10 Engine with 355 horsepower at 4,750 rpm and 455 lb-ft of torque at 3,250 rpm. Includes 6.0L V8 TurboDiesel with 325 horsepower at 3,300 rpm, 570 lb-ft of torque at 2,000 rpm and engine block heater. Includes 10,000 lb. Gross Vehicle Weight Rating. Forced on PowerStroke diesel engines with 66D Pickup Box Delete. 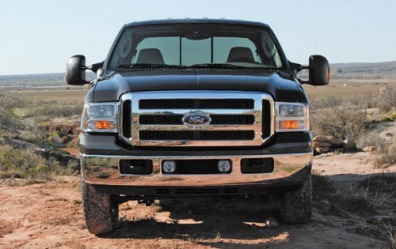 Available as a Fleet only option on F-350 diesel pickups and all gas vehicles. Available and required on fleet and retail 6.8L gas engines when ordered with the 10,000 lb. GVWR package (68D). Includes 5-speed electronically controlled automatic transmission. Includes integrated and molded black cab steps. Includes transfer case and fuel tank skid plates, branded Rancho front and rear shocks, steering damper and "FX4" decal. Includes heavy service front springs, rear stabilizer bar and slide-in camper certification. Includes front and rear chrome bumper with lower valance, underhood service light, single beam jewel effect headlights and bright chrome hub covers and center ornaments. Standard with manual transmission. Provision only. Requires after-market PTO.